18k gold custom made right hand ring consisting of oval shape, natural sapphire, weighing 7.00 - 7.15 carats, having a color and VS2-SI1 clarity, according to GIA grading scale. The center stone measuring 12.0mm x 10.mm x 7.0mm. All surrounding sapphires are genuine with a total carat weight (cttw) of 1.46 carats. Ladies 18 kt white gold fashion ring that measures 12mm wide across the top and tapers to 10 mm wide. Ring is bead set on the sides with a total of 66 round diamond cut pink sapphires that are graduated in colors from deep to light pink. 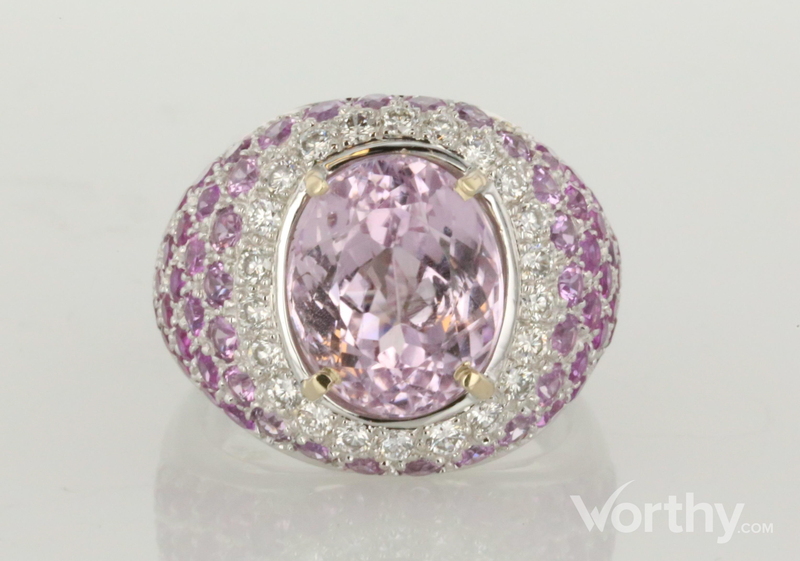 In the center is a halo bead set with a total of 22 full cut round diamonds that surround an oval facetted genuine natural light pink sapphire in the center. Note: Center sapphire has minor nicks and chips.